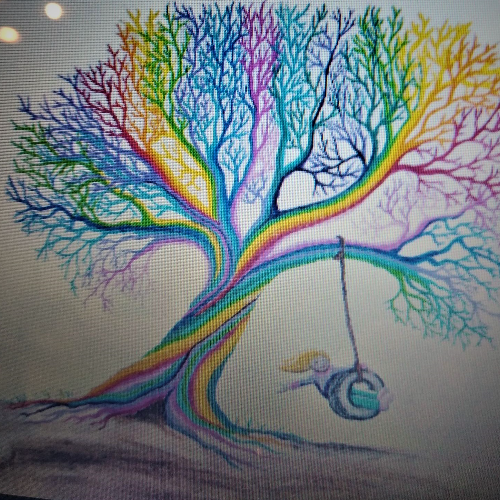 Rainbow Tree Painting using acrylics. This is great for kids to adults. Join us at Glass of Art, Northern Colorado’s only art lounge, where we offer a great experience both in the art you produce and the time that you have. Feel free to order from our full bar and snack menu, or grab dinner and bring it in while you create. Preregistration is required for any instructor led class. Drop-in classes are always available as are our ceramics. There is something for everyone, so join us today! Please note that drop-in classes will have a sample and supplies available, with a minimum amount of instruction offered by the person working the bar, but will not be led by an instructor. These classes are cheaper and more flexible with when you can come in to help our patrons have more opportunities to create.